Screeners are one of the most powerful tools offered with your free membership. The Screeners give you hundreds of different criteria to find possible trading candidates. Filter on price, change, or volume. Refine results based on technicals, ratios, fundamentals, or opinion. Screen for Stocks, ETFs, and Mutual Funds. Save a Screener to run again at a later time. View the Screener results using FlipCharts, or using any Custom View you've created. Save the results you've found in the Screener to a Watchlist. Download the Screener results to a .csv file. 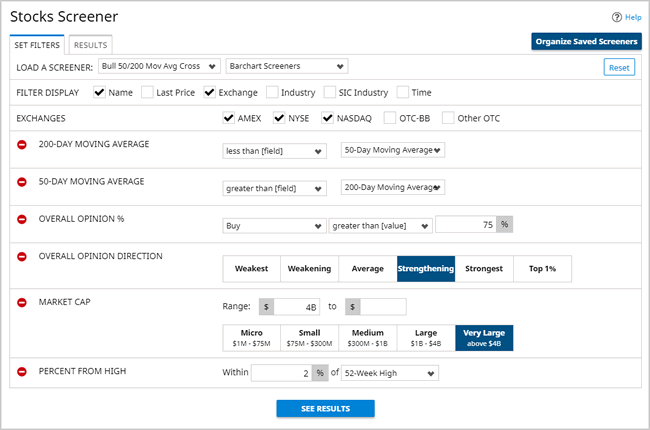 Barchart Premier Members can also screen for equity options using the Options Screeners, and can run screeners on their Watchlists, Portfolios, and many of the popular equity data tables on the site. The Organize Screeners page is divided into 4 tabs, so you can easily see your saved screeners by Screener Type - Stocks, ETFs, Funds, and Options. Each tab displays a list of all your custom saved screeners. In addition, you will find some "Barchart Popular Screeners" on the Stocks, ETFs and Funds tabs to get you started. Feel free to run any of these screeners, add your own filters and criteria, then save them as new screeners in your own account. Run a Saved Screener - Click the Screener name (which is a link). We'll take you to the appropriate screener and show you today's results. Delete a Screener - Click the red icon (first column, far left). You will be asked to confirm your action. Receive and End-of-Day Email of a Screener's Results: This option is available for Barchart Premier Members. When you save a screener, you can opt to receive the top 10, 25, or 50 results via email along with an optional .csv file of the top 1000 results.. Emails are sent at 4:45pm CT Monday thru Friday. Reorder your Saved Screeners - The far right side of the table contains a "Move" icon. To change the position of a screener on the page and reorder it in the list, use your mouse to drag and drop the entire row to a new position.